In the aftermath of Superstorm Sandy, New Yorkers came together to initiate community-labor partnerships to decide on how they wanted their city to be made more resilient. When Superstorm Sandy struck New York City in 2012, the maelstrom blew open the urban landscape’s social rifts. The devastation opportunely coincided with a surge in Occupy Wall Street populist activism, which helped patch some of the immediate wounds. But today, the political energy around “sustainable” rebuilding has dissipated, though many impacted neighborhoods are still struggling. As the governments worldwide respond to climate crisis, the city—and the country—has much to learn from Sandy’s aftermath. 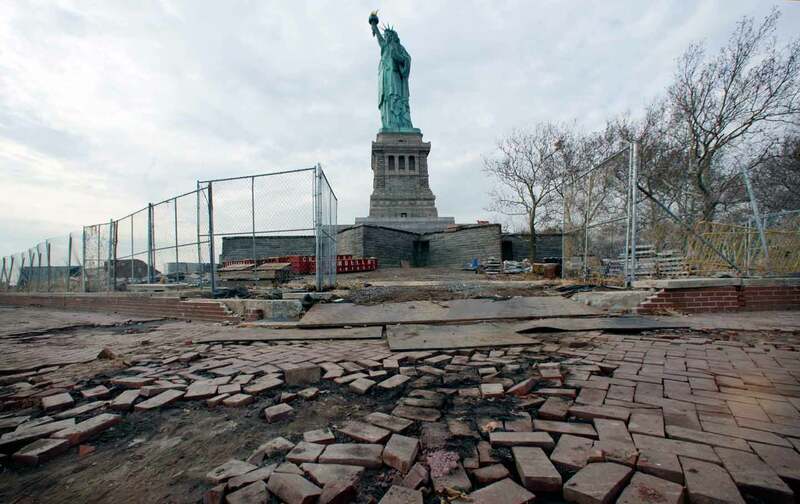 As part of a long-term climate adaptation and mitigation effort, post-Sandy recovery has revealed many of the challenges that other cities will face as global warming escalates in the coming years: To safeguard cities from future disasters, cities need to improve infrastructural protection and promote ecologically conscious urban planning. Locally this means creating resilient local food, transit and energy systems that are responsive to global environmental pressures and accountable to local communities. And all this needs to be done by putting communities to work with stable, living-wage jobs that improve the environmental and labor conditions of local workers. And as cities prepare for the Trump administration, both activists and policymakers face new risks, and opportunities, in a renewed role for urban communities in building environmentally conscious local democracy. In some ways, New York City environmental-justice groups managed to avoid some of the mistakes seen in the wake of Hurricane Katrina on the Gulf Coast. New Orleans represents the nightmare scenario of a city that has struggled to implement economic- and environmental-justice measures after environmental disaster left poor communities of color displaced, exposed to economic exploitation, and politically marginalized in the rebuilding efforts. After Sandy devastated New York’s poor coastline neighborhoods, the community-labor coalition ALIGN seized on the recovery effort to develop a model for rebuilding fairly in the most vulnerable communities. The city’s official rebuilding program, Build it Back (BIB), has been criticized for bureaucratic snares, frustrating financial shortfalls, and project delays. BIB’s workforce program aimed to avoid the exploitation witnessed after Hurricane Katrina on the Gulf Coast, where recovery resources were squandered through undemocratic, exploitative “development” policies and rampant corruption. Similar injustices surfaced in the early days of post-Sandy recovery. Over half of the city’s Sandy victims were low-income renters. More than 620,000 impacted residents, mostly from communities of color, lived within half a mile of key shoreline industrial areas, leaving them doubly vulnerable to future disaster. The migrant day-labor force that drove the initial reconstruction efforts also suffered widespread labor abuses due to their systematic exclusion from both labor protections and basic emergency relief. Amidst this bureaucratic bungling, grassroots environmental-justice groups have been working quietly and steadily to forge equitable climate protection for all. One example: ALIGN collaborated with the citywide Alliance for a Just Rebuilding to spearhead a post-Sandy jobs program based on a locally focused project labor agreement, which has yielded nearly 1,000 jobs, and guarantees prevailing wages standards and labor protections. A union-linked apprenticeship initiative aided employment for women and veterans, while a 20-percent local hiring goal gave residents a stake in rebuilding their neighborhoods. Still, post-Sandy recovery has proceeded unevenly. BIB’s construction pipeline currently contains some 5,565 projects, nearly half of them complete. But these are primarily single-family private homes; just a small fraction target multiple-family dwellings, like co-ops. This doesn’t necessarily mean relief has been unfairly denied to larger structures, as projects are based on complex property-needs assessments. Yet the city’s overall focus on restoring single-family residences, rather than multifamily housing, may overlook unmet needs in communities dominated by rental housing. Though renters received emergency housing subsidies through a separate program, the city faces acute needs for revamping public housing, where working-class families are clustered. But labor equity is a key link to the recovery’s social aspect. ALIGN sees its workforce program as a “national model” for recovery that prioritizes social inclusion over speed and profit. To upscale this framework, ALIGN Executive Director Maritza Silva-Farrell says, vulnerable neighborhoods should be holistically “rebuilt in a way that would have long-term protections.” According to Silva-Farrell, though integrative rebuilding efforts might cost a little more and may take more time, they “actually will protect these neighborhoods in the long term, rather than just the moment-of,” in areas plagued by intensifying climate stress. Now that the national political climate is changing, cities can expect more federal divestment, program cuts, and possible suppression of progressive urban politics. Empowering grassroots organizations to promote neighborhood-based environmental revitalization can be a powerful model for pursuing social and environmental justice in frontline communities. In the isolated, low-income community of Far Rockaway, Queens, post-disaster crisis has sparked an ambitious long-term green rebuilding program centered on cultivating food justice along with redevelopment. Though fresh produce might not seem like a disaster recovery measure, local groups noted the lack of community-based food supplies and grocery retailers after the flooding. With the support of community development coalitions, local groups are now building a self-sustaining infrastructure for a healthy-food economy, to provide both environmental resilience and improved food security year-round through local farms and healthy-food distribution networks. The New York City Environmental Justice Alliance (EJA), a citywide activist coalition, is developing grassroots mitigation and recovery plans across the city’s marginalized communities. A first step is partnering with city agencies to revamp disaster preparedness plans to address the needs of seniors, immigrants, and people with disabilities, and to enhance protections for deteriorating public-housing projects vulnerable to power outages and mass flooding. In anticipation of future extreme weather events, EJA also calls for an extension of the progressive planning concepts that emerged from the post-Sandy recovery dialogue, with equitable protections for frontline communities inside and outside official flood zones. Sandy taught the city that climate change exacerbates underlying hardships in dispossessed communities, but the burst of progressive thinking surrounding the recovery showed how frontline neighborhoods are a critical asset for resolving those inequalities. When equipped with resources to rebuild back to better than what was, a community can turn grassroots struggle into its own renewable resource.